Occasionally, a book will fall into your lap at just the right moment. It doesn’t matter that it’s not the newest release, or that you’ve had it on your TBR list for months, or even that you’ve heard all the good things other trusted people have said about it. The bookappears in a flash of amazingness precisely when you need to read it. That’s exactly how I feel about Dash & Lily’s Book of Dares, the third co-writing partnership of Rachel Cohn & David Levithan. I had previously read both Nick & Norah’s Infinite Playlist and Naomi & Eli’s No-Kiss List a couple of years ago, back at the beginnings of my Reading Renaissance (aka when I started reading again voraciously). I adored Nick & Norah, but Naomi & Eli didn’t click for me. I think that’s why I sat on Dash & Lily for so long. It was a fifty-fifty chance of me liking it, and I didn’t like those odds. Amazingly, I completely loved Dash & Lily even more than I thought possible, and I blame/thank Lily for that. It has been a ridiculously long time since I have identified with a character as much as I do with Lily. She acknowledges that she is aware of his weirdness and that she isn’t the most normal of teenagers. However, she also keeps being exactly who she is, and that’s why she is the freakin’ coolest. In fact, every time she isn’t being true to herself, things never work out for the best. Quirky, awkward, smart, and increasingly proud of it? This is a girl after my own heart. I could read a whole series of Lily. Dash took a bit longer to win me over. While Levithan (of course!) does an amazing job of establishing Dash’s voice from the very beginning, I have to agree with Lily’s Great Aunt Ida/Mrs. Basil E.’s assessment: “His persnicketiness is not nearly as delightful as he’d have one believe, but he has his own charm nonetheless.”The more he allowed the reader behind his veil of snarliness, the more endearing he became. And Dash and Lily together?These two were meant to find each other. Every scene they share was magical, even the scenes where it was only one person and one red Moleskine notebook with the other person’s words. Speaking of the infamous red Moleskine, I thought the scavenger hunt just this side of far-fetched. Really, if this story took place anywhere but New York, I wouldn’t have believed it so quickly. Instead, the zaniness of it- scouring The Strand, feeling up Santa, late night dancing to the sounds of a rockin’ klezmer band- kept a grin plastered across my face. Andlet’s not forget the incredible secondary cast of characters, from the aforementioned Mrs. Basil E. and the rest of Lily’s exceedingly large and bizarre family to Dash’s BFF Boomer (whether he wants him or not) and his group of loyal misfits. These people are more outrageous than the residents of Stars Hollow on Town Meeting Night. I didn’t know I needed this book, but apparently… I really needed this book. Cohn & Levithan will not receive a doubt from me again. 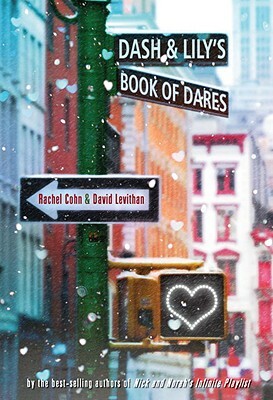 I know Dash & Lily’s Book of Dares will be one of my yearly holiday books, though it’s not just a holiday-themed story. It’s a tale of taking risks, letting your guard down, and accepting people for who they are. Obviously, if you couldn’t already tell, I’m mad about Dash & Lily. Glad you liked it! This is one my favorite books. It's such a quick read that I plan on re-reading it around the holidays every year. So fun and festive! I'm so happy you read and loved this one! I love it when you pick a book up at just the right now! Sometimes I need those to help me remember why I read! I get down in the dumps when I don't like a few books...but picking up an awesome one always helps!